Author: Czerneda, Julie E. Set In . . . 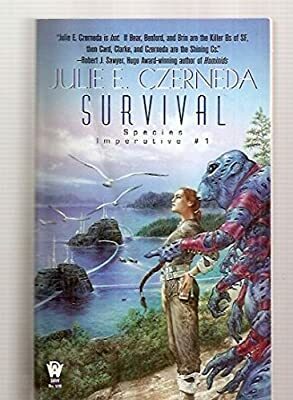 Description: Herself a biologist, Julie E. Czerneda has earned a reputation in science fiction circles for her ability to create beautifully crafted, imaginative, yet believably realized alien races. In Survival, the first novel in her new series, Species Imperative, she draws upon this talent to build races, characters, and a universe which will draw readers into a magnificent tale of interstellar intrigue, as an Earth scientist is caught up in a terrifying interspecies conflict. Senior co-administrator of the Norcoast Salmon Research Facility, Dr. Mackenzie Connor, Mac to her friends and colleagues, was a trained biologist, whose work had definitely become her life. And working at Norcoast Base, set in an ideal location just where the Tannu River sped down the west side of the Rocky Mountains to the Pacific Coast was the perfect situation for Mac. She and fellow scientist Dr. Emily Mamani were just settling in to monitor this year's salmon runs when their research was interrupted by the unprecedented arrival of Brymn, the first member of the alien race known as the Ohryn to ever set foot on Earth. Brymn was an archaeologist, and much of his research had focused on a region of space known as the Chasm, a part of the universe that was literally dead, all of its worlds empty of any life-forms, though traces existed of the civilizations that must once have flourished in the region. Brymn had sought out Mac because she was a biologist -- a discipline strictly forbidden among his own people -- and he felt that through her expertise she might be able to help him discover what had created the Chasm. But Mac had little interest in alien races and in studies that ranged beyond Earth, and as politely as she was capable of, she tried to make it clear that she was unwilling to abandon her own work.